We’ve looked at a lot of different versions of “A Christmas Carol” over the last few weeks, but this collection has been far from comprehensive; one particular genre of “Carols” I haven’t covered is the TV adaptation. Not a TV special or TV movie, mind you, but actual “Christmas Carol” episodes of TV shows, and there are lots of them. “The Flintstones Christmas Carol,” “The Jetsons Christmas Carol,” “Mr. Magoo’s Christmas Carol,” “Bugs Bunny’s Christmas Carol,” etc. Most of these are gimmicky, shallow retellings that, while quirky and amiable in their own way, capitalize not on the story’s actual thematic content, but on the name recognition of the Dickens classic. 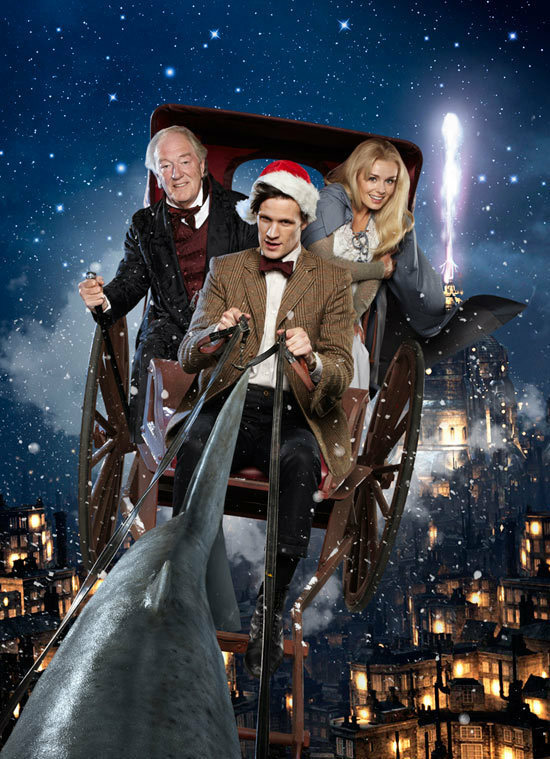 When Doctor Who did its version of “A Christmas Carol” last year, though, the results were absolutely spectacular, and I don’t think it’s an overstatement to say that this is one of the best, most powerful retellings ever made. In fact, it’s my second-favorite version ever, right behind the film you’ll be reading about on Christmas Day. Writer Steven Moffat doesn’t treat the “Carol” connection as a simple gimmick – he understands exactly why the Dickens tale resonates so strongly, and sees a perfect opportunity to transplant that story into the sci-fi landscape of Who. The results are thought provoking, heartwarming, riotously funny, and thoroughly brilliant. 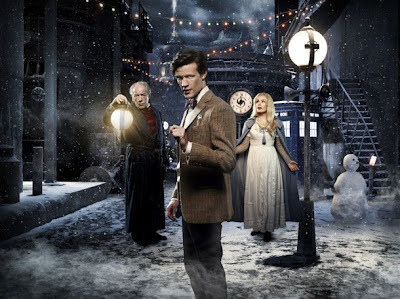 This was the “Christmas Special” from 2010, produced after the fifth series (the first with Matt Smith playing The Doctor), and was the first ever episode of Doctor Who to air in the United Kingdom and America on the same day. I vividly remember watching it on BBC America the evening of Christmas Day and feeling like I had gotten the best present in the world. The episode begins when a star cruiser – one carrying 4,003 passengers including honeymooning companions Amy and Rory – is caught in an electrified cloud over a strange planet. With controls lost, the ship will crash within the hour unless the owner of the planet, Kazran Sardick, uses his atmosphere-controlling spire to save the ship. The only problem? Kazran won’t acquiesce. He is a bitter, misanthropic old man, and simply doesn’t care about those in peril. But with his friends in danger, The Doctor won’t stand for this, and he decides to use Charles Dickens’ “A Christmas Carol” as a blueprint to make Kazran a better man, showing him his past, present, and future in an attempt to give Kazran a heart. 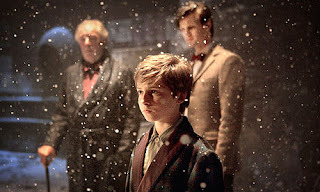 Most of the special focuses on the past, as The Doctor meets a young Kazran and goes on a Christmas Eve adventure with him every year, alongside a girl, Abigail, whom Kazran’s father kept in cryogenic freezing after her family took out a loan. Over the years, Abigail and Kazran begin to fall in love, but will this give adult Kazran a heart, or will the ramifications only make him all the more bitter? The episode clearly isn’t a straight adaptation of “Carol” – if it were, it wouldn’t be Doctor Who – but instead uses many of Dickens’ ideas and themes to tell a story that is as fun as it is dramatic. The parallels are obvious. Kazran is Scrooge, and as played by the incredible Michael Gambon, he is one of the darkest versions of the character. Scrooge is a cruel miser, while Kazran, like his father, keeps people in cryogenic storage for loaning money and is willing to let 4,003 people die just because he can. We truly hate this man when we first see him, but The Doctor, as he is wont to do, sees the humanity lying deep down, a humanity Kazran and the audience come to discover as well. 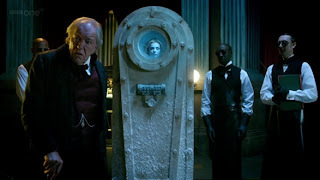 The Christmas Past set-up is a fascinating scenario, one that analyzes Kazran’s life just as the Ghost analyzed Scrooge’s, but instead of merely observing, the Doctor gets involved, giving Kazran something truly worth living for. I dare not spoil how Moffat weaves in the Ghosts of Christmas Present and Future, but suffice it to say, both are brilliant, powerful moments. More importantly than surface parallels though are the ways in which Moffat flawlessly transposes the core themes of Dickens’ work into this story. “A Christmas Carol” has always been about painting a portrait of a man’s life, looking at the many cause-and-effect relationships that go into making us who we are. That’s why Scrooge endures as a character, because we can all see little pieces of ourselves in him as we watch his tragic life’s journey unfold. The same holds true for Kazran. When confronted with the full, blindingly honest particulars of our life’s tapestry, who wouldn’t be inspired to make a change? No one is perfect. Kazran has more to repent for than most people, but deep down, he is not a villain, just a man whose life spiraled out of control. Just like the Ghosts of Dickens’ tale, what the Doctor gives Kazran is a beautiful gift, a chance to examine his life and the many divergent paths he neglected taking. That’s the true power of Dickens’ “Carol,” and though many of the details change here, that’s exactly why the Doctor Who version is just as impactful, if not moreso. But this is just as much Moffat’s story as it is Dickens’, and his distinctive stamp can be seen on every inch of this brilliant episode. As with many great Moffat hours, “A Christmas Carol” is filled with lots of big, inventive ideas, all of which could form the basis of their own episode. The fish living in the clouds, the cryogenically frozen love interest, a romp through many different Christmas Eves across all of space and time, etc. What makes Moffat a brilliant writer is that he can combine all these big ideas seamlessly into one perfect hour, and the wealth of creativity just makes the story that much richer. There’s also the humor, which is incredibly sharp and often gut-bustingly hilarious. The back-half of the episode is far more serious than the beginning, but before the story gets too dark, Moffat gives the Doctor a wonderful set of one-liners, including one of the show’s all time best lines: “We’re boys! And what do boys say in the face of danger?.....Mummy!” Great stuff, and for a while, the Doctor’s dialogue is a glorious non-stop barrage of insanely clever writing. The jokes slow down at a point, but Moffat still finds ways to interject humor into the darker moments without destroying the carefully constructed tone. One of the heaviest moments of the special, for instance, is lightened by a hysterical scenario where the Doctor tries to escape his new fiancée, Marilyn Monroe. Throughout it all, Matt Smith is utterly fantastic; after the landmark fifth series, I wondered if he had any more to give, but “Carol” proved he had many more cards up his sleeve. “Carol” cemented his status as a brilliant comedic actor and, more importantly, as the rare performer who could ride tonal shifts completely naturally. When he gets serious, we really feel it. The Doctor – specifically, a caring and humanitarian Doctor like Smith’s – is the reason why “A Christmas Carol” works so easily with the show’s aesthetics. Not only is Smith’s Doctor nutty enough to imitate Dickens, but as a time traveller, he clearly believes in Dickens’ message about the power of looking at the entirety of a person’s life. 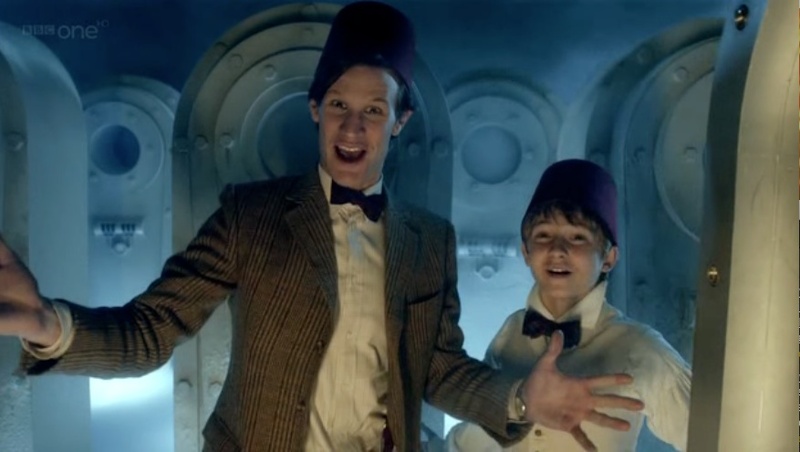 Smith sells it brilliantly, scene after scene, and after this episode aired, Smith was officially my favorite Doctor. It’s mind-blowing to think he only got better with the subsequent sixth series. Michael Gambon is equally impressive as the true star of this episode, Kazran. Like the best Scrooges, he unflinchingly establishes the character’s cold, unfeeling nature, and then gradually, organically illustrates how Kazran changes. It’s a wonderful performance, and for those who have only seen Gambon has Dumbledore, “A Christmas Carol” showcases a very different side of the actor. 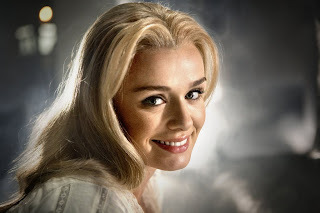 Katherine Jenkins, a famous Opera singer in England, also guests as Abigail, and is surprisingly good. It’s not the meatiest role, but Abigail is right at the heart of the hour’s dramatic core, and she’s wonderful in her big moments, especially the Opera-esque song number during the climax. This is one of the best guest casts ever assembled on Doctor Who, and it’s also a testament to the writing that we come to care for these people we’ve never met before so completely in the span of one short hour. “A Christmas Carol” is also a rousing technical achievement, a visual marvel that has set a high bar for subsequent episodes. Toby Haynes’ direction is lush and cinematic, and Murray Gold’s beautiful score is the crowning achievement of his career to date (and that’s saying something). This is an episode that works on so many levels. It’s one of the all-time great hours of Doctor Who, an inventive, terrific sci-fi story, a fun riff on ideas from “A Christmas Carol,” and ultimately, a serious, pantheon-level adaptation of the classic tale. In my mind, it’s required viewing during the holiday season, whether you’ve watched Doctor Who before or not. My little brother had never seen the show before when I convinced him to watch this on Christmas day, and by the ten-minute mark, he was mad at himself for not starting sooner.